‘Fragmentation Feeds The Need For Automation’, that was pretty much the message here. The mobilisation of consumers, cross-device targeting, wearable tech, these are all key trends at Ad Week Europe currently being hosted in London. Here the ad tech sector is pitching itself as the only viable means of taking advantage of both the pace of change and scale of opportunity. As mentioned in the previous Ad Week Europe post, the programmatic sector is using the four-day event to sell itself to other branches of the industry on a scale as never before. To put things into perspective, Matt Scheckner, the (clearly American) executive director of Advertising Week Europe, even declared: “Programmatic is the prettiest girl at this year’s ball”, when describing levels of interest in the sector. Take out of that what you will. AppNexus, MediaMath and TubeMogul have thus far taken to the Ad Week Europe stage in a bid to firstly tame the wider advertising industry’s fear of ad tech. And then secondly, pitch their wares as driving ROI for brands and organisations as a whole. Not just more ad tech that can engineer more problems. AppNexus followed up on its earlier research announcement, sponsoring a panel session themed on programmatic and mobile. But if this blog is to be frankly honest, it descended into a generic debate around mobile in general, with little emphasis on programmatic. 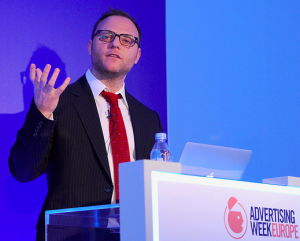 It was panellist Stephen Jenkins, Millennial media, VP of marketing, EMEA, that made the most succinct of observations on how mobile media’s emergence is requiring a shift in how advertisers formulate their attribution strategies. An issue raised here just last week. “Attribution is a challenge, but what mobile does offer is the link of physical and digital, as it’s in someone’s pocket all day long. From there we can start to trace back [as to which media placements are driving value both on and offline],” he said. Meanwhile, Erich Wasserman, Mediamath, chief revenue officer (pictured), took to the stage yesterday delivering a presentation entitled: “Gaining clarity in a fragmented landscape”. Here the message was how fragmentation of the media landscape was creating countless more media opportunities – 3.5 trillion a month according to Wasserman’s presentation – with digital accounting for 57% of them. This assessment stands up to scrutiny when you consider that wearable tech (check here for mobile agency Somo’s April Fool’s on wearables) and cross-device targeting were two of the other key themes at the conference. Wasserman raised these themes and identified the burgeoning wealth of media opportunities that will come and this now demands brands to adopt an automated approach to their media strategies. “It presents a large challenge, and at the same time it’s difficult to gain access to audiences… we just can’t do this by hand any more,” he told attendees. “The challenges is faced by many of the strongest organisations in the world. And they’re all using automation to increase their access to consumers, and automation brings what otherwise would be an impossible manual task. Sticking with AppNexus’ message of ad tech providing value, as opposed to adding layers of needless complication, TubeMogul hosted an event on viewable ads. The term “viewability” has now entered the Ad Week Europe lexicon. Here TubeMogul’s UK managing director, Nick Reid told a packed room (most claimed they weren’t in ad tech) the industry-wide initiative to provide a common technology standard, that will subsequently establish a common metric for what is and isn’t a viewable video ad via Open Video Viewability. As mentioned earlier, interest in the sector was palpable by the (needless) queuing outside the programmatic sessions down at BAFTA. But debate during said sessions was surface level at best. So while widespread interest in programmatic among advertisers is clear, there was little genuine widespread understanding of the sector in evidence. To use Scheckner’s analogy of comparing the conference to a “ball”, ExchangeWire would describe the programmatic sector as more of a debutant, with execs from the likes of Rubicon Project and Vivaki, proving the same draw as other more glamorous attractions at the conference like Idris Elba, James Corden and Steve Coogan.